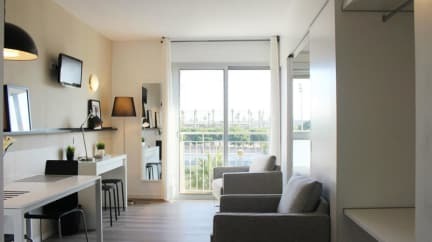 Residencia Campus del Mar i Barcelona, Spanien : Boka nu! A great place. 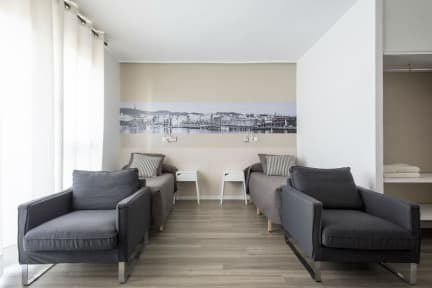 Just three minutes down is the beach with freshwater showers and a café. A dip in the Med. is a great way to start the day: ) Rooms clean, modern and huge! Some with balconies. The breakfast- kit in the fridge is generous. Like the two desks- two armchair concept too. Three min to metro, or bus (at beachstreet) & ten min to city centre. Staff with limited english skills use digital translate tool. Charming!